Wikipedians love lists. Thus, my list-generating bot is now active on over a dozen wikis, most of then upon request by users, who have set up quite a variety of lists to generate and update. However, a few issues with this approach have emerged. Some of them are technical; lists get too long for wikitext, some desired functions are hard to implement, and using templates to set up parameters is awkward. Some issues are social; while several wikis have no problems with bot-generated lists in the article namespace, some (OK, one) communities have concerns, ranging from the data quality of Wikidata, over style issues, to the fact that the list can only be edited via Wikidata, and not directly on the respective wiki. 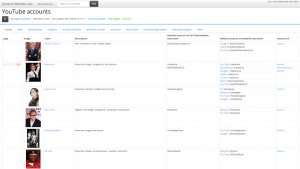 A proposed solution is to implement Wikidata lists as a tool. This solves the “social issues” by moving the lists outside the wikis, while releasing storage and display options from the limitations of MediaWiki. 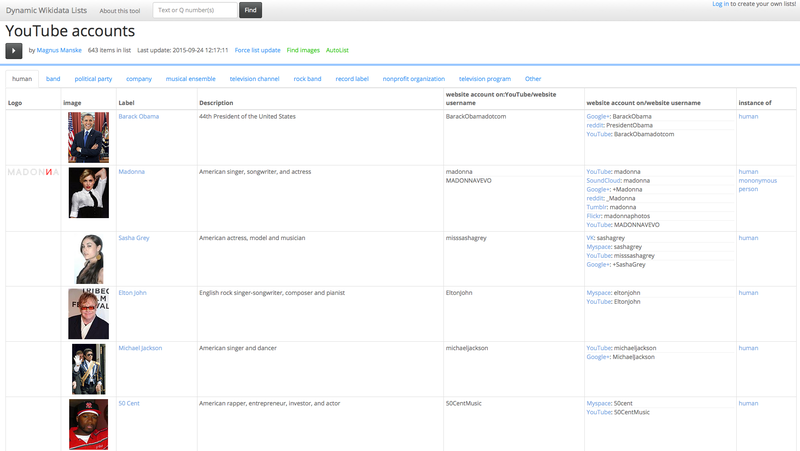 So, for the impatient: Dynamic Wikidata Lists. In this tool, everyone can view lists, and change options like language, columns, and sections on-the-fly; to create your own lists, use your trusted WiDaR login. Lists consist of two parts: The items resulting from a Wikidata Query (there could be other data sources down the line), which is stored in the tool, and updated every six hours, or on demand; and the data in the columns, which is loaded on-the-fly, directly from Wikidata. This is a trade-off; no need to store large amounts of data in the tool, and getting the latest data straight from the source, in exchange for a few seconds of waiting time for large lists. Once a list is loaded, the display can be changed with little or no need to load more data. However, even my largest list with over 4,300 items loads the items in ~10sec, and the labels for the column values in another ~5sec, on my machine. The “>” icon on top of the list opens the display options, and there are quite a few of those. Seven columns types, three sections types, multiple (sub-)section levels, an option to display the top-level section as tabs, arbitrary precision when using dates as sections (e.g. force birth dates into decades), options to override column titles per language, etc. Links go the the Wikipedia article in the current language, or to Wikidata by default; columns with links to specific wikis are possible. Preferred statements are shown if present, normal ranks otherwise. Columns can be sorted by clicking on the column header (there is no default sort, as the labels to sort on are loaded after the table is created). A list, once created, can only be changed by the person who created it; but anyone with a WiDaR login can create a new list based on an existing one, and change it in any way desired. List and default language can be specified in the URL, so you can link to a list from Wikipedia in the local language. This was written by Magnus. Posted on Thursday, September 24, 2015, at 16:42. Filed under Wikidata. Bookmark the permalink. Follow comments here with the RSS feed. Both comments and trackbacks are currently closed.